Our Liquid Ring Pump Models CLR 1800 RPM, Models CHLR 3600 RPM, will deliver up to 80 GPM, 100 PSI (230’ TDH), Vacuum to 28”Hg +. Port sizes are 1”, 1 1/2” and 2” NPT. Shaft seals available include acrylic/graphite or PTFE packing and John Crane™ Type 2106, 1 or 9 mechanical. All Bronze and all 316 Stainless Steel construction are available as well as the standard Cast Iron with bronze impeller. Bart Lobee patented his first rotary pump in 1910. It all started with an idea and a penchant for quality. 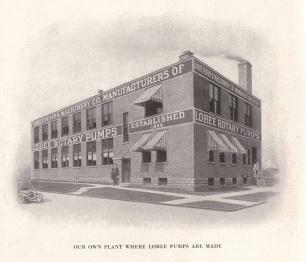 Lobee Pump & Machinery Company earned a reputation of building industrial products that last and last. Today, the tradition carries on with a line of heavy duty gear, liquid ring and sump pumps that command a broad range of applications requiring high performance, durability and long life. Lobee Pump and Machinery Company Manufactures Industrial Process Pumps, Complete Pump/Motor Systems and Accessories for many markets including Machine Tool, Plastics, Chemical, Agriculture, Food/Beverage, Pharmaceutical, Pulp/Paper, Marine, Automotive, Construction, Mining and Energy industries. Our Gear Pumps are external tooth spur type for positive displacement operation and are designed for efficient performance between 0 -1800 RPM, with flows to 90 GPM. Port sizes from 1/8” to 2”. Pressures to 150 PSI continuous. Shaft seals available include Acrylic/Graphite or PTFE packing, Buna lip seal and John Crane™ Type 1, 9, or 2106 mechanical. The toughest Vertical Sump Pump in the industry, our Floor Mount and Suspended pumps are designed for continuous duty operation up to 130 GPM (single) and 80’ Dynamic Head. Standard sump depths up to 10’, longer column lengths available for special applications. All Bronze or 316 Stainless Steel construction models are built from stock. We offer Water Tight and Explosion Proof switches, Premium Efficient, Hazardous location motors and Duplex Pump packages to 260 GPM. Direct and Base Mounted Pump Units are built to order as a stripped or turn-key system for any ‘plug, plumb & go’ application. Available in 56 to 184 motor frames including Premium Efficient, Explosion Proof, Wash-Down, TEFC, and ODP. 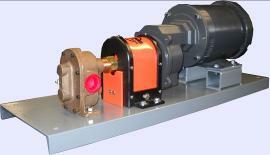 Optional Motor Starter, Variable Speed Drive (inverter), Relief Valve and Heater are also available. Our Flow Raters are available in 1/2”, 3/4” and 1” NPT ports with flows up to 40 GPM at 125 PSI. Accuracy is +/- 5% through the range. These heavy duty process type flow meters offer visual flow readout. These are excellent basic indicators that will handle low viscosity fluids, chemicals and corrosives.